As seen in the Daily Mail, 'Fuhrer's household staff reveal intimate details of the Nazi leader's life'. As seen in the Daily Star: 'Hitler servant diary claims Nazi leader lusted after niece'. You'll be £19.99 closer to your next £10.00 credit when you purchase Living with Hitler. What's this? Order within the next 3 hours, 5 minutes to get your order processed the next working day! The reader is introduced to Hitler's Bodyguard Karl Krause (1934-39), his house administrator Herbert Döhring (1935-43) and chambermaid Anna Plaim (1941-43). From these accounts we get a deeper sense of Hitler in close proximity. These accounts massively add to our understanding of Hitler as a three dimensional character, especially from subjects like Plaim who only knew Hitler's home life, having rarely left Berghof. The series is able to shed light on his likes and dislikes from foods to his hobbies, creating a strange sense of humanity. This collection also provides the reader with fresh anecdotes, observations and portraits of Hitler's entourage and relatives. Plaim's images of Eva Braun come from finding torn fragments in the bin, whilst Döhring sheds light on Martin Bormann's demeanour. 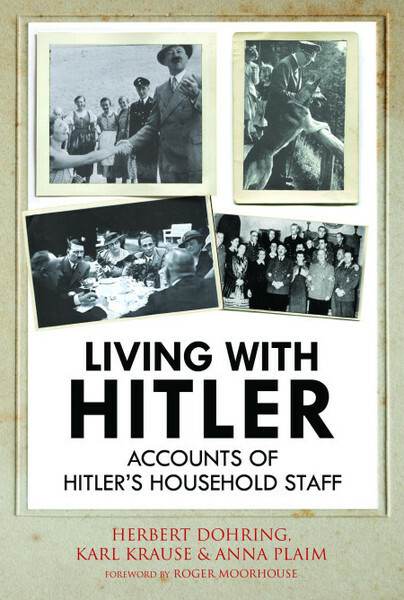 The contributors have provided personal views of Hitler and their life serving him. They have been at pains to present what they believe is a true account without seeking to praise or denigrate him... The accounts are fascinating and provide material comparative to the accounts already published by other servants, military and SS personnel. In much of the material, there seems to be no real feeling of a terrible war going on around them in any personal sense. I found the book to be interesting, and adds another dimension to what we know about Hitler. For the first time, a fascinating new book brings together the translated accounts of Hitler’s housekeeper, valet and chambermaid.